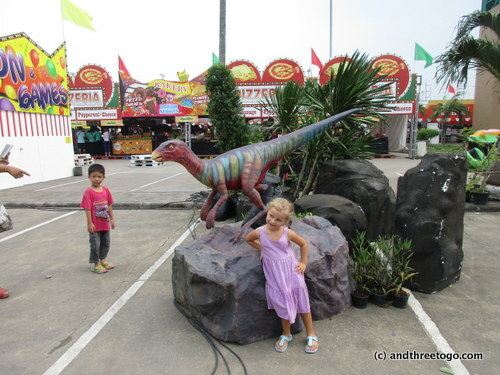 This past week two things were pretty cool here in Phuket, Halloween and a Dinosaur Carnival! Things pop up here in Phuket that seem to appear from nowhere and seem to have no reason for being there. 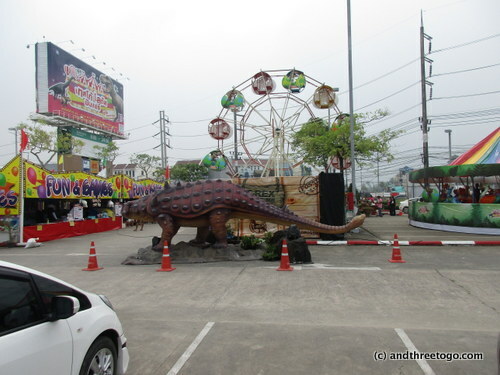 A good example of this would be the Dinosaur carnival that was taking up most of the Tesco parking lot in Kathu, Phuket recently. Apparently massive replicas of dinosaurs and carnival rides are a perfect way to get people to shop at your huge clearance sale. Pretty cool really. The only problem is that you had to spend 300 baht ($10 US) in the store in order to get tickets for the games (which normally cost about 20 baht at other carnivals). So I guess the little carnival did get me to shop at their clearance sale. Dammit, I fell for it. 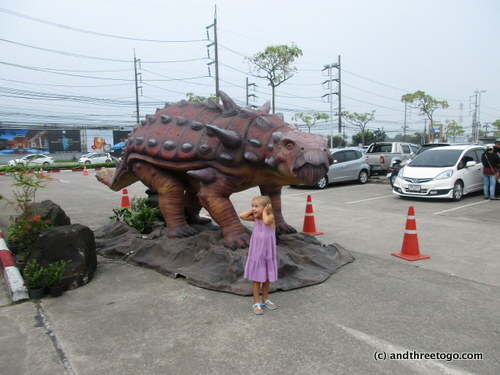 Random dinosaur fair in a Tesco parking lot. 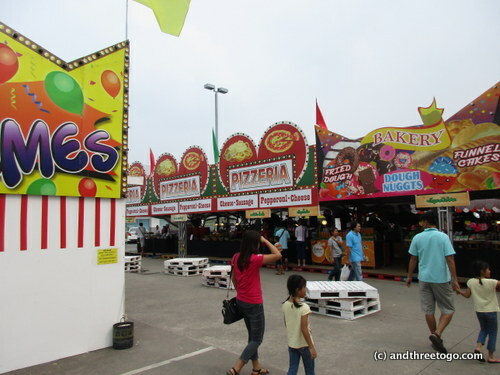 Unfortunately the funnel cakes and other carnival treats were just signs, I was so bummed! Under those signs were Thai snacks, Papaya salad, and clearance clothing. Poop. And now onto our Halloween shenanigans! Halloween is not a holiday that is widely celebrated here in Thailand. The stores will sell some Halloween supplies like face paint, a small choice of costumes, and fake blood. There is no trick-or-treating (so sad! ), but most schools will have a party for the students and some bars are catching on that adults want to dress up and drink. Last year I threw a party for Z and her friends for Halloween, this year I was just too worried about not being fully well from my surgery that one of my lovely friends took it on and I just helped with the crafts and decorations. (Thanks, Jo!). It turned out to be so fun for the kiddos. Z also had a party at her school that was fantastic, so pretty much Z got double the fun and double the candy (hooray for parent taxes!). Z was an adorable fairy if I do say so myself. Which I do I guess, as I am the one writing this… Anyways, onto the pictures! 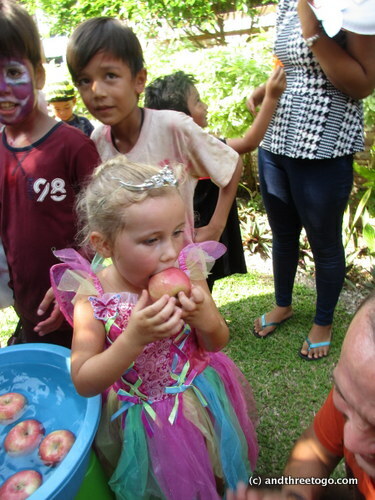 Z bobbing for apples at her school party… she did pretty good! She got one! On a completely different note, it was incredibly hot this day. All of us were pouring sweat. What a different experience than when I was a kid and I was always upset that I had to cover up my costume with a coat! Chad and I dressed up and went out for the night! I put some spider temporary tattoos all over my face arms and neck. 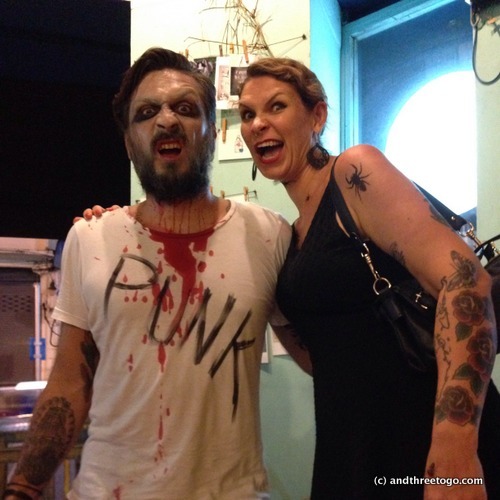 Chad’s costume =”Punk is dead”. Not bad for quick and unprepared costumes. What did you do for Halloween? Did you get any Reese’s peanut butter cups? Want to mail them to me??? Leave a comment and let’s chat! Veeeryyyyy Cooool Halloweeeeen! Very smart, too. Z was sooooo cute in her fairy outfit, a perfect idea. But the parents were High-Fiving me. My favorite costume this year was the little zombie dancer, about four-years old. The last few years in Santa Rosa we would be all ready for trick or treaters and would not get any. It was kind of sad actually. 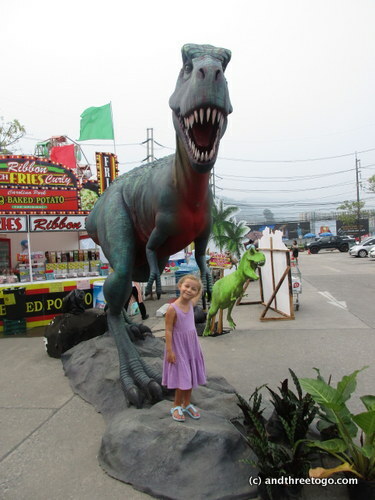 Dinosaur carnival! Sign me up! Yeah, clever way to get product out there. I always enjoyed going to Tesco then discovering there was some sort of outdoor setup of food and clothes. I can imagine that pub street would be pretty crazy! 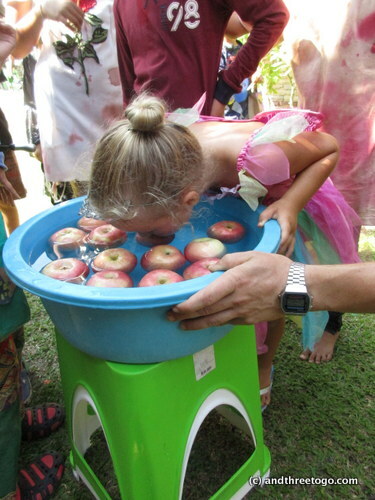 Great costumes and love how you did the trick or treat – very creative and loads of fun for the kids. We spent Hallowe’en flying back from Florida – not the best idea!! Oh bummer! You were nearly in America during one of its most fun holidays! 🙂 were people dressed up on the flight? That’s a great idea (the recycling of candy)! Do you guys have a special treat that you make for the holiday? They got to pick six pieces to eat. We steer them towards the chocolate. Like Reese’s. ?. An old favorite. But I have one who turns bad with red food color. She self-avoids it because it makes her rage! I hope you have a good week. Z looks very sweet (and a tad sweaty – haha) in her fairy costume. What a bummer there weren’t any funnel cakes at the dinosaur carnival. What a tease! Seriously! I was pretty bummed! Z was such a cute fairy 🙂 and your costumes were scarily awesome. We were in Madrid, but didn’t really see so many people dressed up save for Freddy Krueger who gave us directions. We were asleep quite early though as l had just flown in from Nigeria that morning, so that might have had something to do with it, and our flight out to London was early the next day as well..glad you guys had fun!!! Flights that long and close together… I would definitely have gone to bed early as well!